The dead are rising from their graves in search of human prey... Sharpen your axes, barricade your doors and prepare for the Zombie Influx! 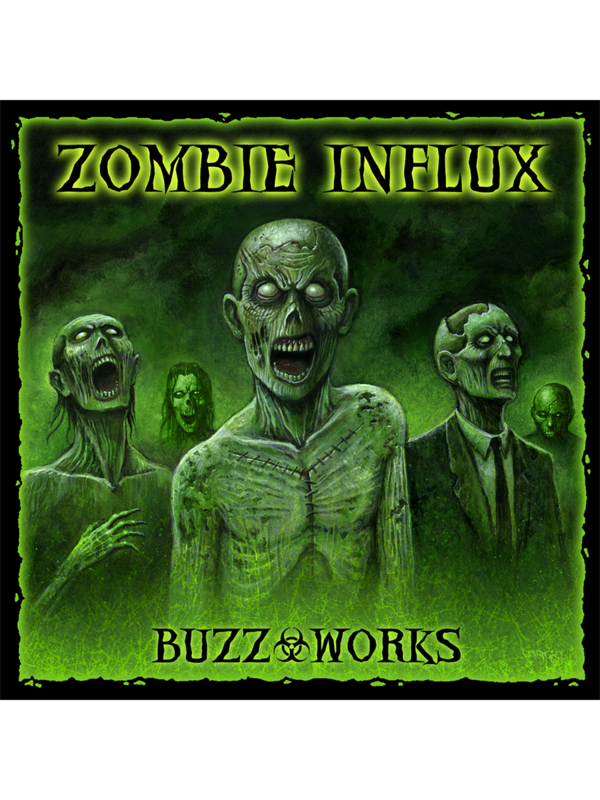 Buzz-Works founder Jeff Hartz brings the living dead to your doorstep with this creepy concept album that creates the horror and panic of a zombie invasion through the use of frantic emergency news broadcasts, ambient sound effect tracks and ominous cinematic music. A lifelong fan of George Romero's classic zombie films, as well as Sam Raimi's Evil Dead series, Jeff was inspired to create Zombie Influx as a tribute to the movies that warped his mind. Teaming with Joseph Vargo and William Piotrowski of Nox Arcana, Jeff set out to capture the terror of a zombie invasion along the lines of the 1938 "War of the Worlds" radio broadcast. The result is a dark atmospheric soundscape that paints a bleak portrait of a world ravaged by the living dead.